BrandEDÂ shows school leaders how to move beyond mascots and clever taglines to showcase their school's assetsâ€”and enhance communication with students, parents and all stakeholders. 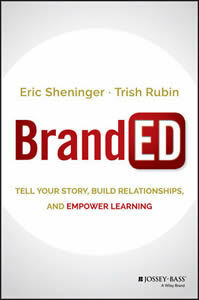 Through smart conversations about the genuine power of branding in education, this book shows how a "BrandED" mindset can improve schools by strengthening relationships, improving communication, telling your story, and increasing resources. Ideas borrowed from the world of business are adjusted for the unique needs of education. Practical tools, templates, and resources allow you to implement the strategies presented quickly and easily, while stories of real-world schools illustrate what BrandED thinking can do for your students, teachers, and community.